A client wanted a higher-resolution version of the StarFox character model. I'm quite impressed with the quality of the original model I was given to work from (Purportedly ripped straight from the game by http://commitment2purplex2.deviantart.com/ ). It's hard to improve the quality when it's all so uniformly well put together. Full Model comparison. If you can't tell which is the new and which is the old, I don't blame you. They use the same texture, and the geometry updates are rather subtle. 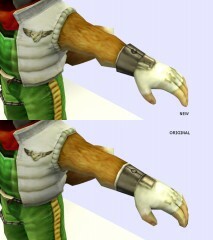 Upgraded Fox McCloud, left arm and insignia. 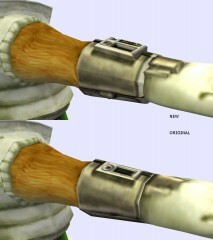 Upgraded Fox McCloud, right arm bracer. 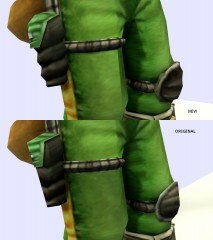 Upgraded Fox McCloud, thigh pouch and knee pad.